I was ranting mentioning on Twitter the other day that I think buses need a design enhancement. I take the bus at a busy stop, full of people craning their necks, some even walking up and down the sidewalk, trying to figure out if any bus in the long lineup might be theirs. The problem is that the bus numbers only show up on the front and back of the bus. Which is fine when the buses are driving through traffic, but not when they are lined up, separated by mere inches. My complaint comment spawned a bit of discussion back and forth with some of my tweeps. I suggested that buses should have an illuminated number sign that pops out perpendicular to the side of the bus, so that potential riders could look down the line of buses and figure out which one is theirs. Now, I did some research to see if anyone might have actually implemented this anywhere. I couldn't find any real-life examples, but I should have known that the fine folks over at Yanko Design would have showcased this very concept at some point. Two years ago, no less. A pop-out sign that appears when the bus lines up at the bus stop and opens its door. In LED for easy viewing at night time. 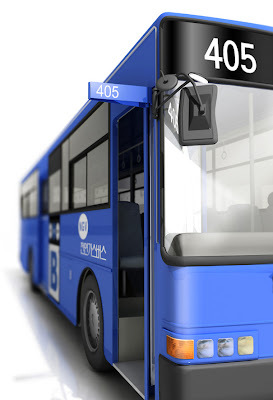 It would have to be re-thought to work with the buses we have in this city, since the front door is not folding, it is comprised of two separate panels that open away from each other. But I'm sure this could be adapted quite easily. The only other change I would propose would be to make the numbers larger for better readability. Of course, this still won't help anyone with vision issues, so someone needs to develop a GPS-based app that a user could have on their phone, which could tell them (visually or using audio) which buses are lined up at a stop at any given moment. In real time. Since that could be a while, could we please petition the bus companies to implement the side number signs? What do you think? Have you seen these in use anywhere or is this a long shot?